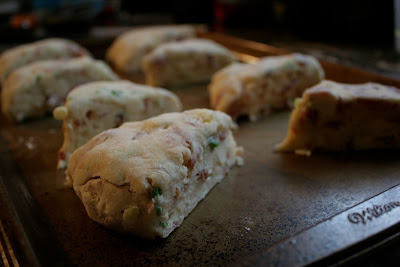 Bacon Cheddar & Chive Scones....make ahead, freeze, then bake! In my attempt to make hosting Christmas Eve a little easier, I decided to look for recipes that I could make ahead and freeze. 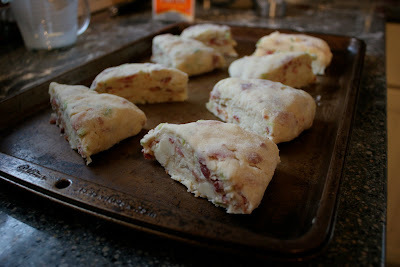 These scones were on the King Arthur Flour's Bakers' Banter Blog, and I knew I had to try them. I love that you can bake these straight from the freezer, no need to even defrost! So I made a batch for us to taste test, and they were a huge hit. Then I made a batch and froze them. Here is the recipe, straight from King Arthur. I would NOT recommend using the ziplock bag method she demonstrates in the blog, it is very messy and doesn't blend well. I found using a pastry blender initially, then your hands worked much easier. 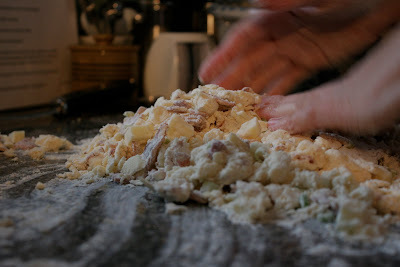 I also ended up using alot more cream to help the dough come together. I used scallions instead of chives, and I used Cracker Barrel Extra Sharp white cheddar cheese. The pictures shown below were taken Travis. There were so many great shots, it was hard to decide which ones not to use, so I am using most of them. Since we froze them after shaping we didn't get a picture of our finished product, so the baked scone picture shown above is from KAF. This picture is my favorite, see the little hands gripping the counter? 1) Whisk together the flour, salt, baking powder, and sugar. 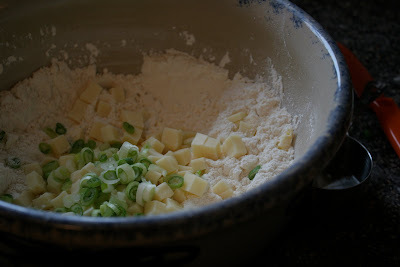 2) Work the butter into the flour until the mixture is unevenly crumbly. 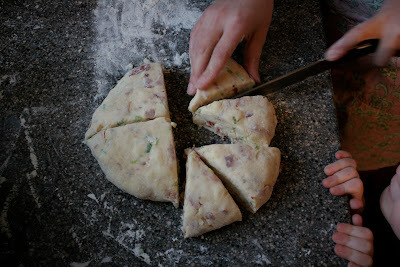 3) Mix in the cheese, chives, and bacon till evenly distributed. 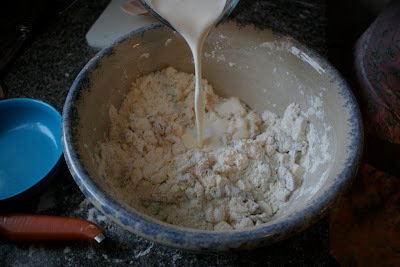 4) Add ¾ cup of the cream, stirring to combine. 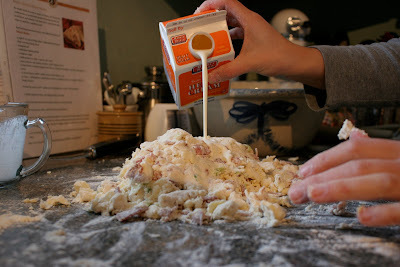 Try squeezing the dough together; if it’s crumbly and won’t hang together, or if there are crumbs remaining in the bottom of the bowl, add cream until the dough comes together. 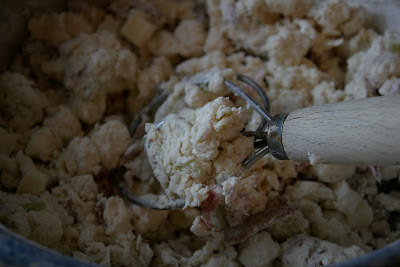 Transfer the shaggy dough to a well-floured work surface. 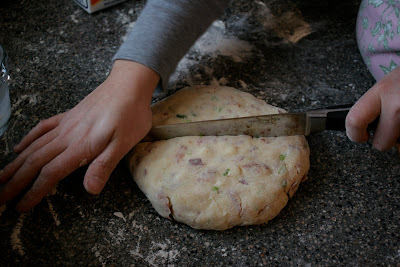 5) Pat the dough into a smooth 7" disk about ¾" thick. Transfer the disk to the prepared baking sheet. 7) Brush the scones with a bit of cream; this will help their crust brown. 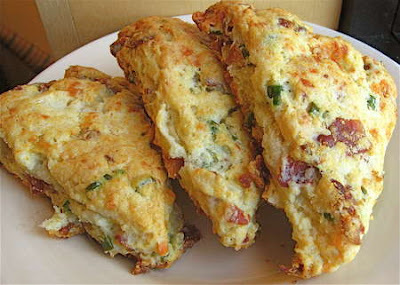 •Want to make scones now, freeze and bake later? Make scones up to the point they're on the baking sheet, cut and ready to bake; don't brush them with cream. Freeze, then remove from the sheet, and wrap airtight in a plastic bag. When you're ready to bake, remove however many you want to bake from the freezer, place on a baking sheet, brush with cream, and bake in a preheated 425°F oven for 35 to 40 minutes, until golden brown.